Aside from family, my two great passions. Beer and music. To me, they just go together so well. Beans/Toast, Cheese/Onion, Beer/Music. Don’t get me wrong, with social drinking, conversation is the thing. But, a top tune in the background…….The number of times I’ve been in a pub in the last 30 years and said “tune” are innumerable. Jaz & I were thinking a while back, that whilst the vast majority of the venues we drink in have great tunes, the pub jukebox is dying out in favour of the tastes of the bar staff. Now, when the staff have eclectic tastes that match your own, that’s dandy. 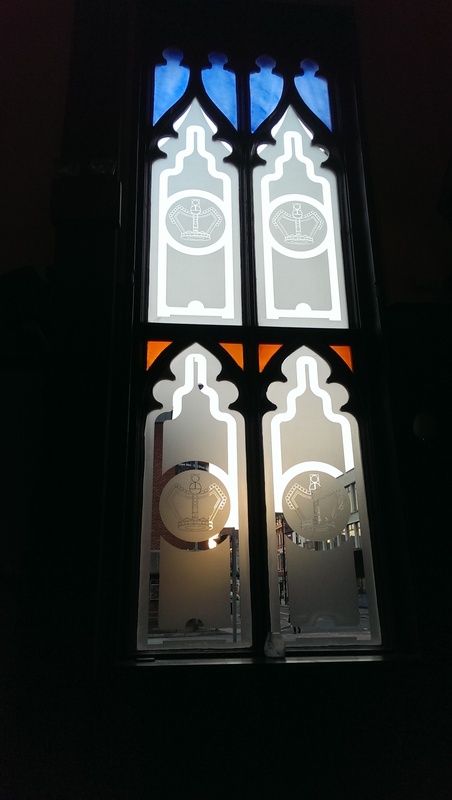 But what if they don’t…… It got us to thinking…How many pubs in the City Centre still have Jukes? Let’s call this series of articles a (less than scientific!) ‘survey’! Before all that, I got a message from my arch-nemesis yesterday morning, telling me that Micro Bar had Dunham Massey’s Chocolate Cherry Mild on. A beer I’d only tasted in bottle once. I promise you faithfully, I REALLY wasn’t intending to sally forth last night, but that was a temptation too much. Oscar Wilde had it right…. Micro Bar by name…….No jukebox here. This was a ME moment! Chocolate Cherry Mild by Dunham Massey Brewery. Given that the brewery is probably 15 miles from my front door, I have had very little of their stuff on draught. This is probably their most famous beer and I had only tried the bottled version (and that was only last week!). Time to fill that gap. This dark ruby beer instantly filled my hooter with Black Forest Gateau aromas. This carried on in the mouth. Lovely fruity cherry with a dry almost cocoa powder chocolatey flavour. 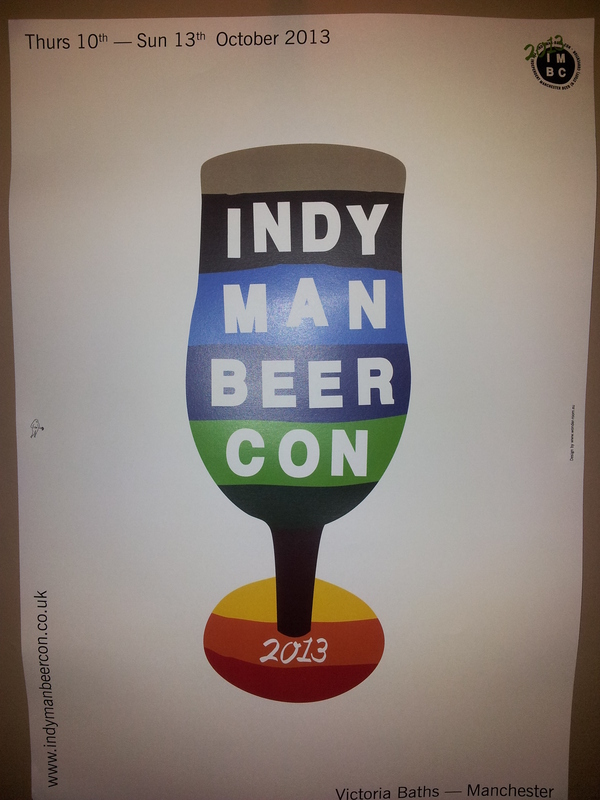 This is a Ronseal of a beer (‘Does Exactly What It Says On The Tin’! 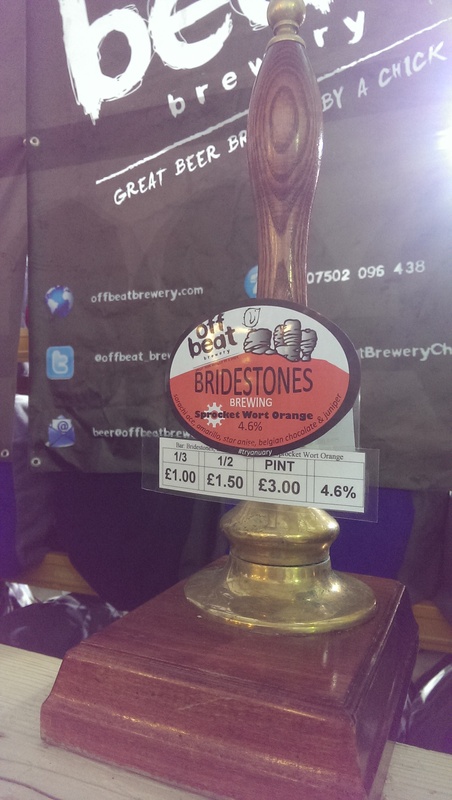 ), a nice hoppy grassy touch in the aftertaste as well. As good as cherries in beer gets short of being a Kriek. This was an early start for me, as this bar shuts at 18:30. 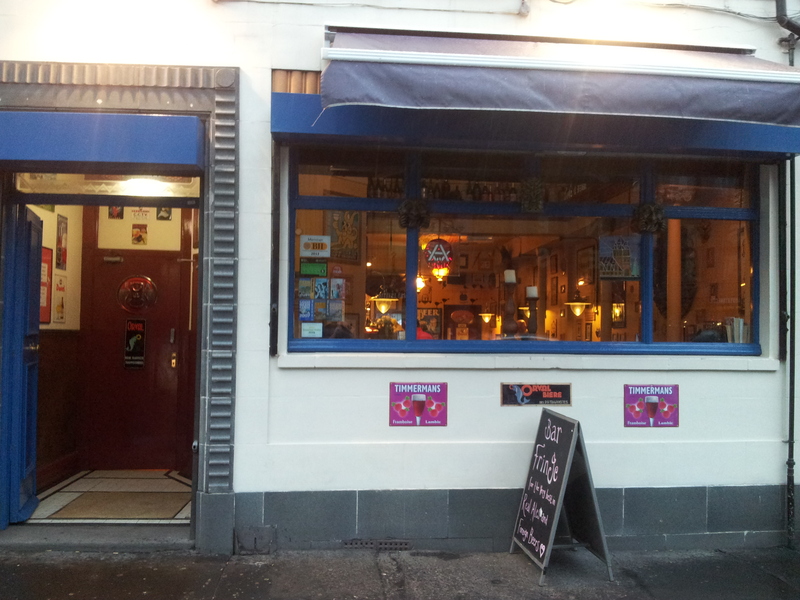 As its name implies, this bar is indeed small and is the nearest I’m likely to get to a Micro Pub any time soon. 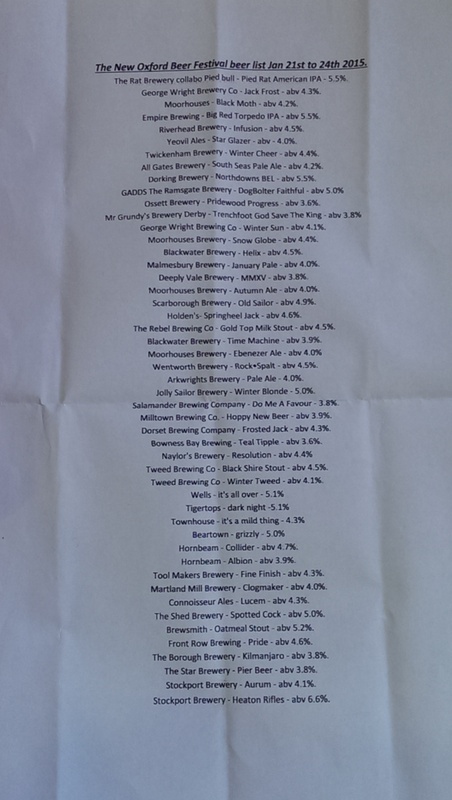 That said, they still manage to fit in 5 hand pumps (one being for cider) and a number of craft/keg fonts. 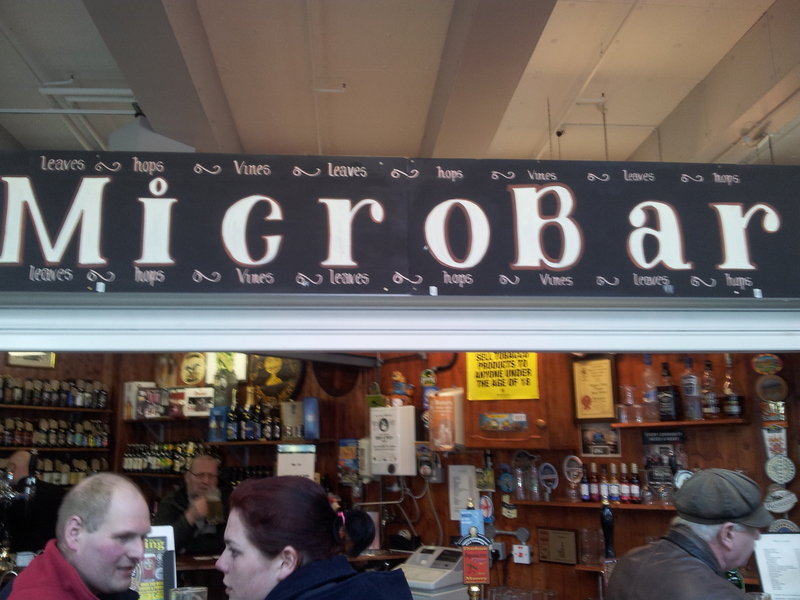 Within its limited footprint, Micro Bar also manages to fit in a role as a substantial ‘off-licence’! 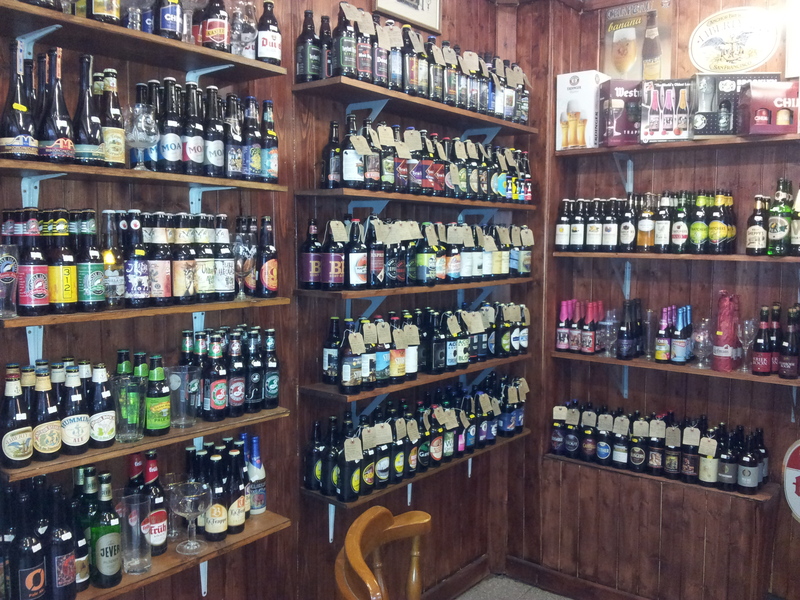 Bottles from around the world with a large proportion being UK sourced. I was seriously tempted to buy the Dark Star Imperial Stout, but….next time, maybe! 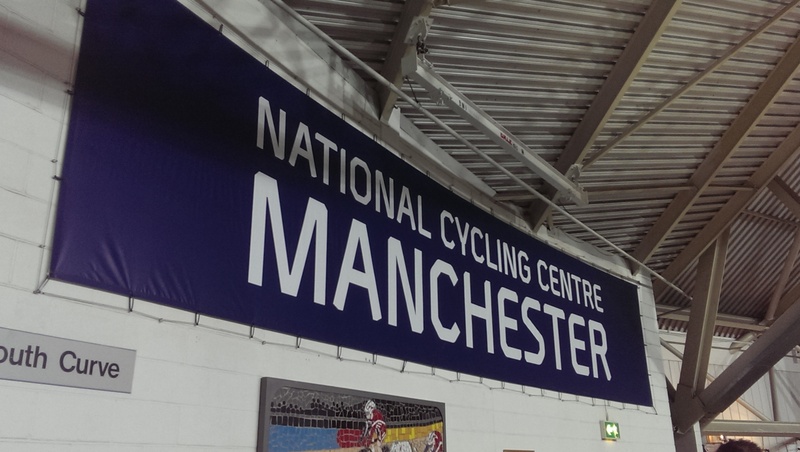 Who’d have thought that such an oasis could exist within the walls of the hideous Manchester Arndale! Food tip. If you’re feeling peckish, there are a lot of take-away vendors of quality on adjoining stalls. Pancho’s Burritos being two stalls away. You can even sit in the bar area AND eat your grub. What more could you ask for? 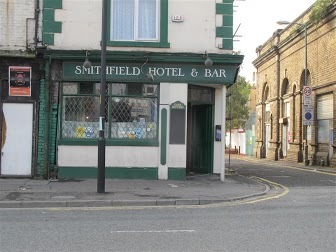 The Smithfield has the feel of a local on the edge of the city. 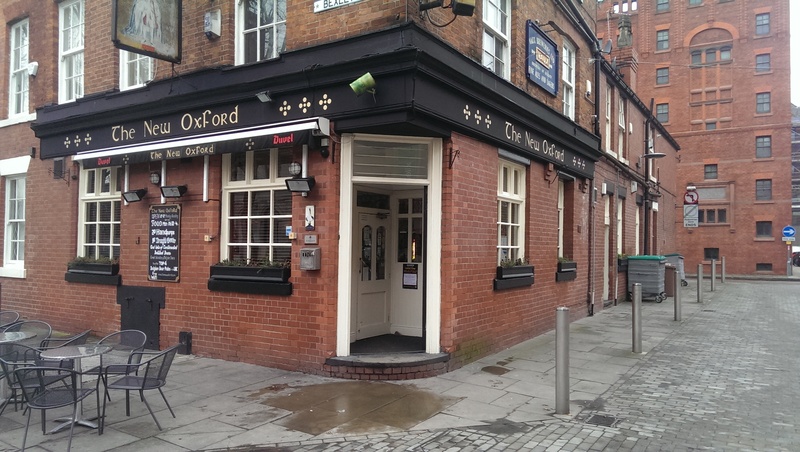 It sits four square within the Northern Quarter without actually feeling part of it. When compared with other nearby bars, it certainly is a character apart. A good choice. Toasty on the nose with a lovely creamy texture and full of roasted malt flavours. 3.3% abv and lots of flavour. The Jukebox leaned heavily on 80s/90s Manchester staples, Joy Division, New Order, happy Monday, Stone Roses etc with an Irish slant via some compilations and a bit of Van Morrison. A good selection, but not the most eclectic you’ll find. 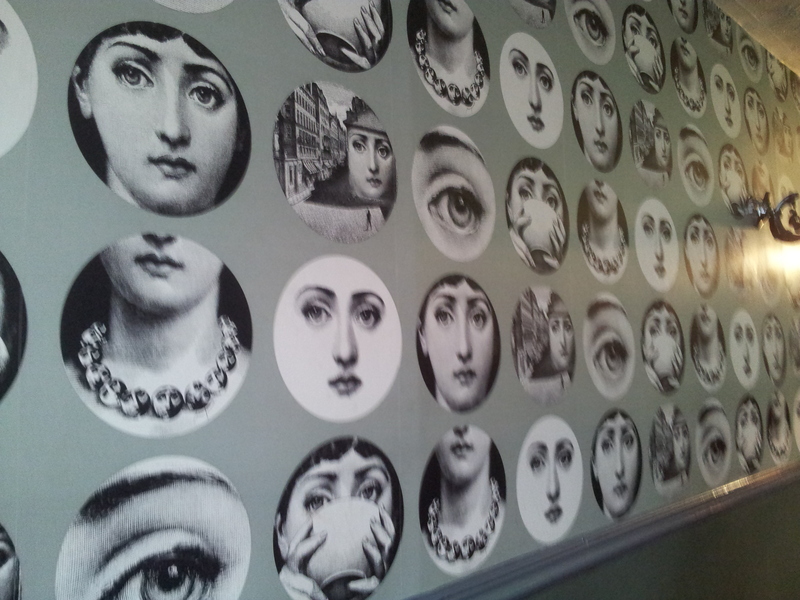 Certainly no match for the zany, surreal wallpaper! 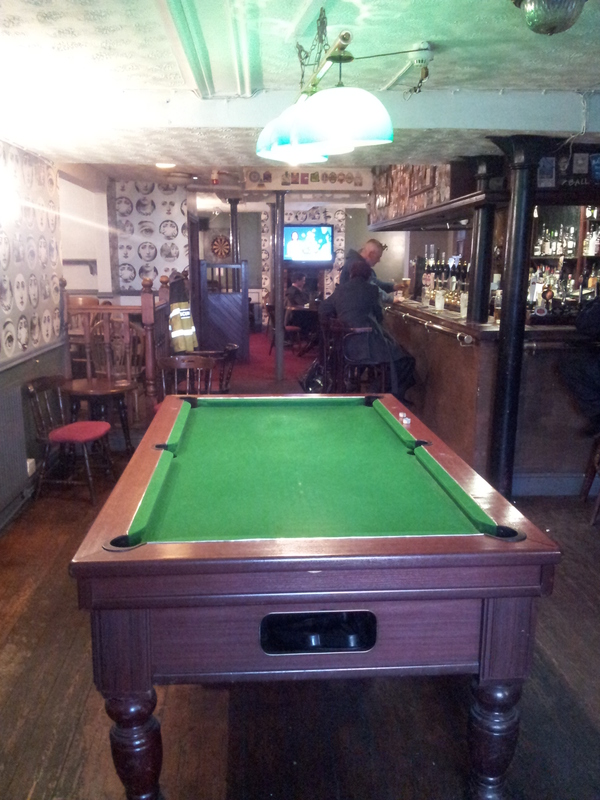 For me, one of the standout things in this pub is the presence of a pool table, something you don’t see much of in Town. Now. If you’ve never been here, you need to. Frequently. 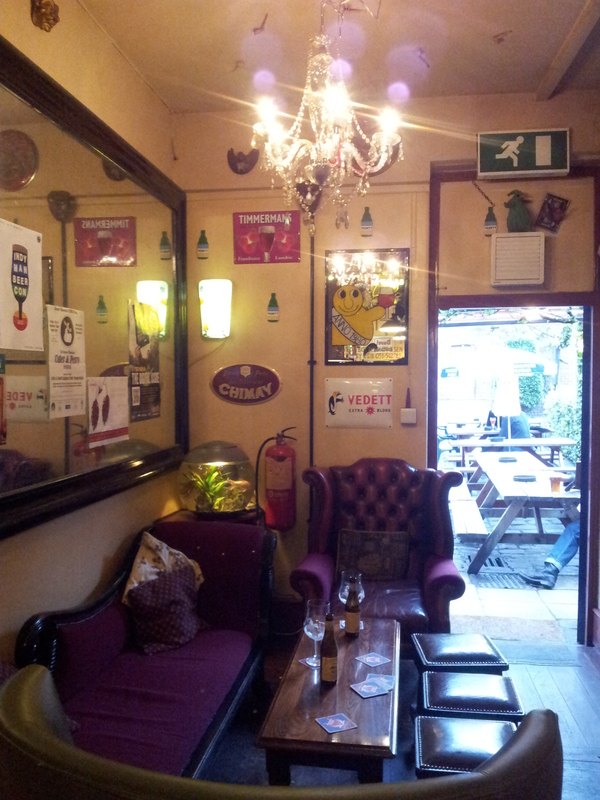 This is possibly the most eclectically decorated/furnished pub in Manchester. There is no overt attempt to be cool. It just is. 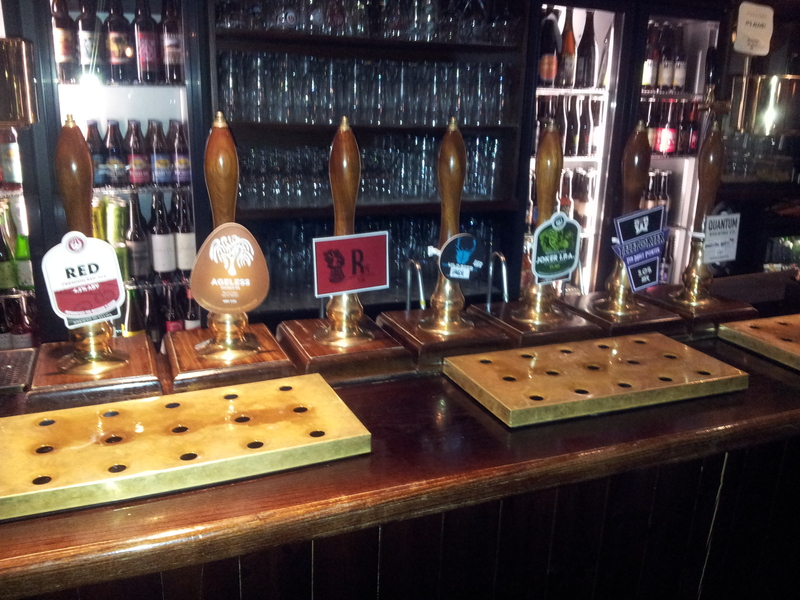 5 handpumps with one for cider.Lots of craft/foreign keg fonts. One rally interesting thing by its absence. Guinness. 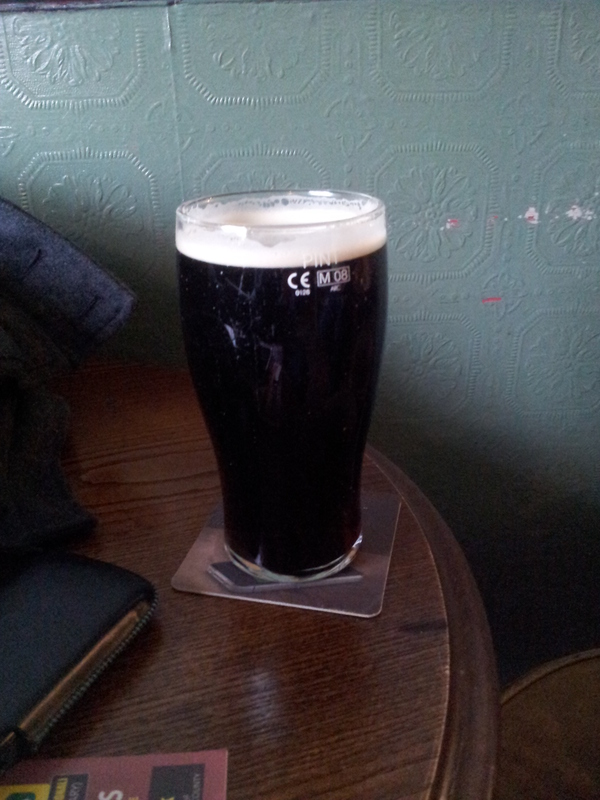 Replaced by Marstons Oyster Stout. An interesting and welcome touch. Beer? 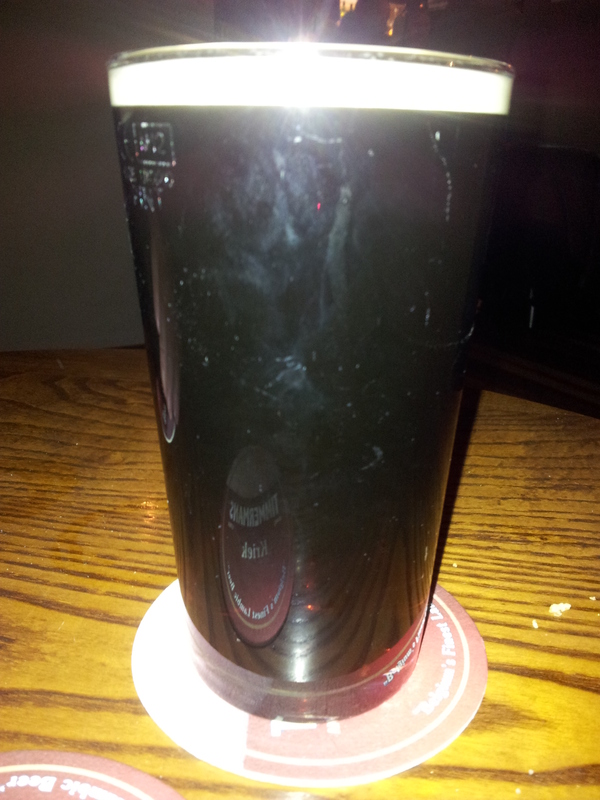 Continuing with Milds, Midnight Rose by Pennine Brewery at 3.7%. Dark ruby, buttered toast nose. A fruity mouth with more than a hint of damsons/plums. A belting pint. (Not had much by Pennine before). I was hoping to meet the legendary landlady, but more later! 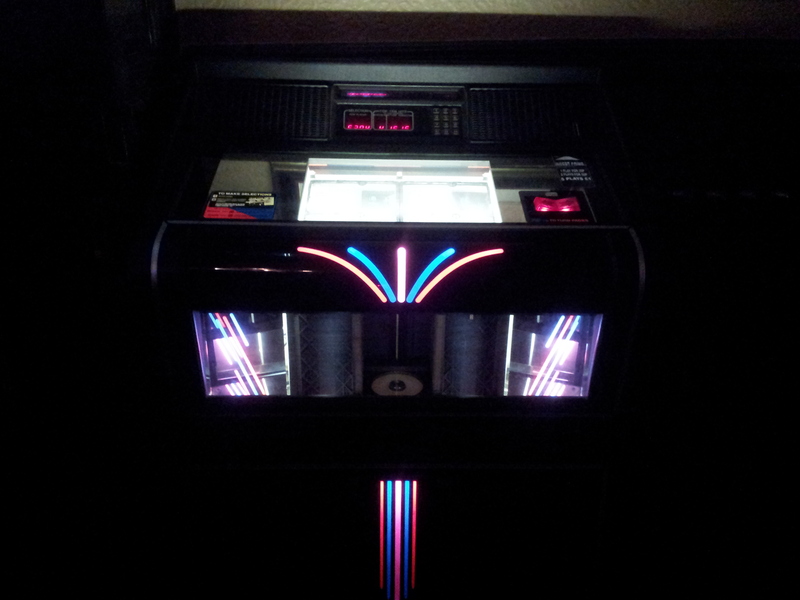 The jukebox? A cracker! Just to have Curtis Mayfield (one of my musical heroes) was a winner for me. Put a few tunes on in here, Freddie’s Dead and You Gotta Have Peace by Curtis and Misty Mountain Hop by Led Zep. Classics all. 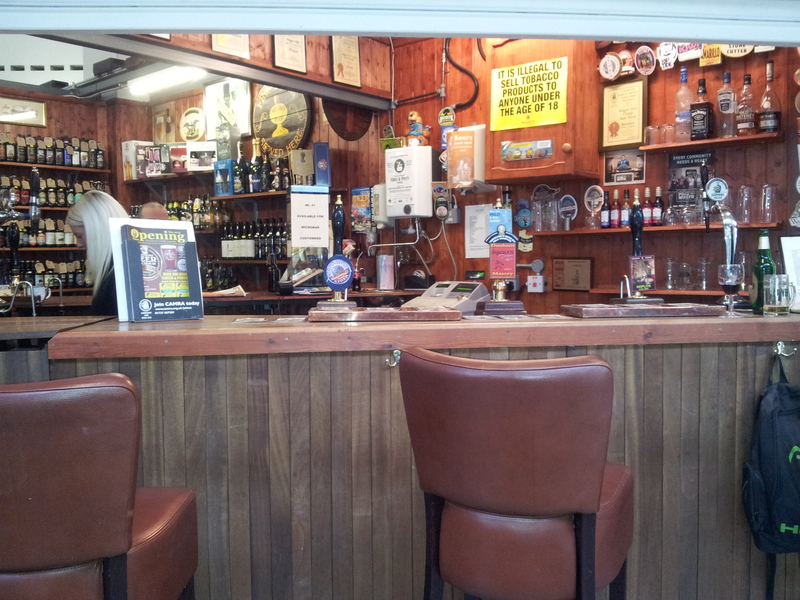 The landlady made her presence felt via Twitter by recommending the Ducktor Who by Green Duck Brewery. Who was I to argue? A good recommendation. A golden beer with an apricot/grapefruit hoppy nose. Juicy sweet malt with oodles of citrussy American hoppy flavours. At this point, a female cyclone blew through the room, chatting to the regulars. The famous landlady, known to Twitter as Banana Charlie! To say the least, she left an impression! Top lady, top bar. 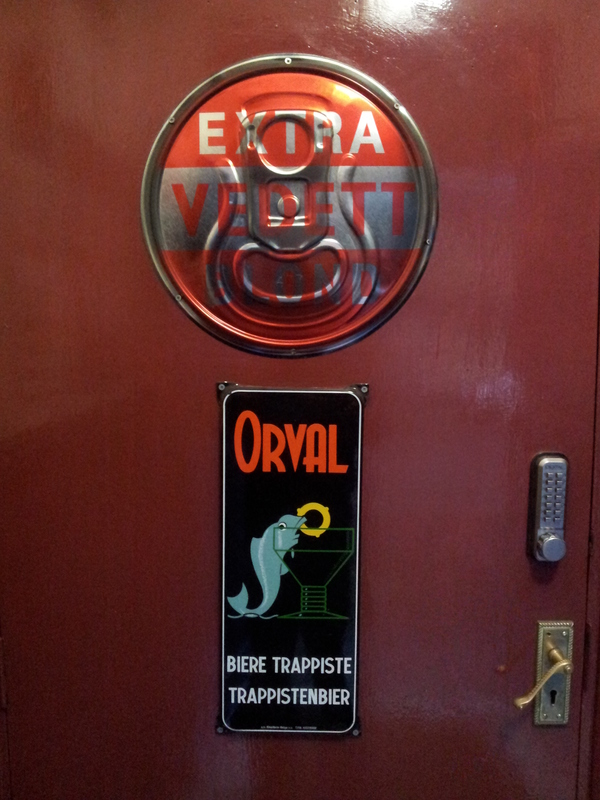 This is another bar where you can source some hitherto unseen beers. Tonight, Great Yarmouth Brewing Company ‘DNA‘. A 3.8% pale hoppy brew from Norfolk. Am informed by the mighty Nate Dawg that this is a new set up in the seaside town. I had a sneaky sip and it was nice indeed. I’d have had another one, but another juke was calling! Walking down Oldham Street from Great Ancoats St, it was difficult to miss the space where a recent fire burned down a huge premises a few doors up from this pub. 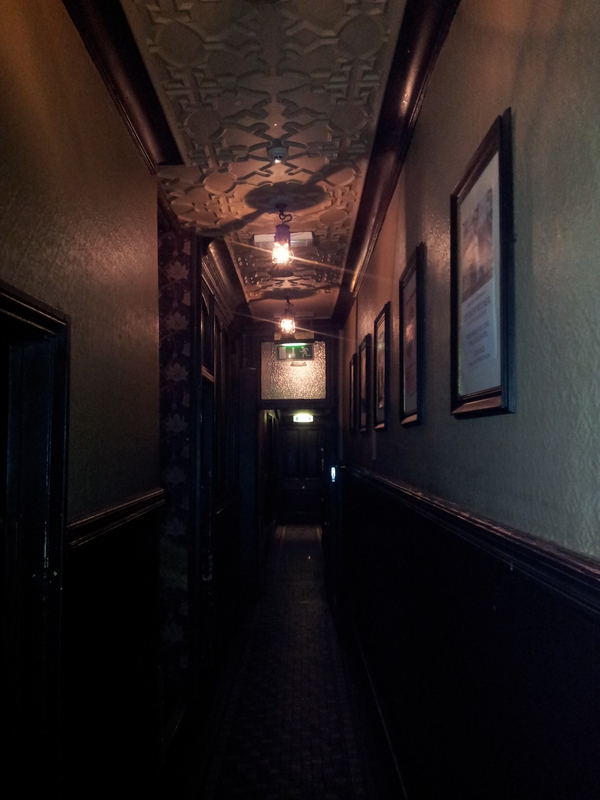 There was daylight as we approached to pub entrance. Walking in was like being back in the womb. Dark reds, warm, comforting. It was that dark you could imagine this being a vampires lair. Anyway, there was a band on and it was busy. Notwithstanding that, we got served quickly and Jaz grabbed a seat whilst I scoped the Juke. Another cracker this. For my £1, Prince ‘Sign O’ The Times’, Talking Heads ‘Take Me To The River’ and Ray Charles’ ‘What’d I Say Pts 1 & 2’. Aural class! First beer, Another mild, this time a 4.8% fruity number from Titanic called Nautical Mild. This was almost as plummy as their Plum Porter! Dark, fruity with a nice dryness to the finish. My tunes finished. Then some genius located Bloodbuzz Ohio by The National! The High Violet album on a Juke? I had to leave to calm down! Great album! I’ve loved The Castle for over 30 years. 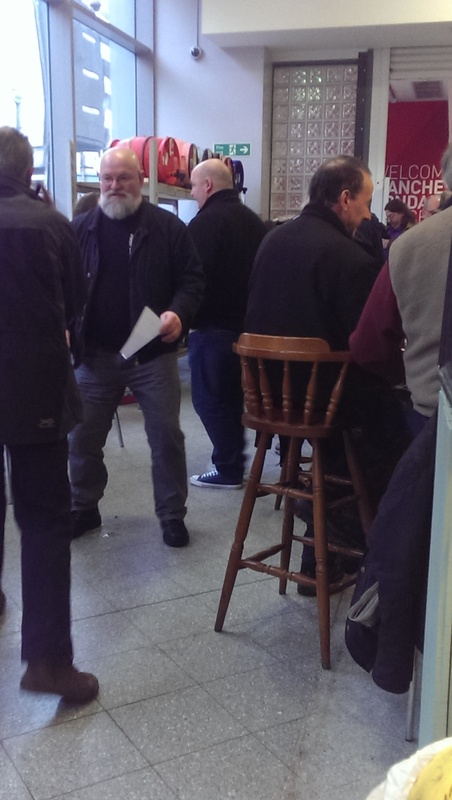 Good to see it thriving and new generations of drinkers enjoying its charms. 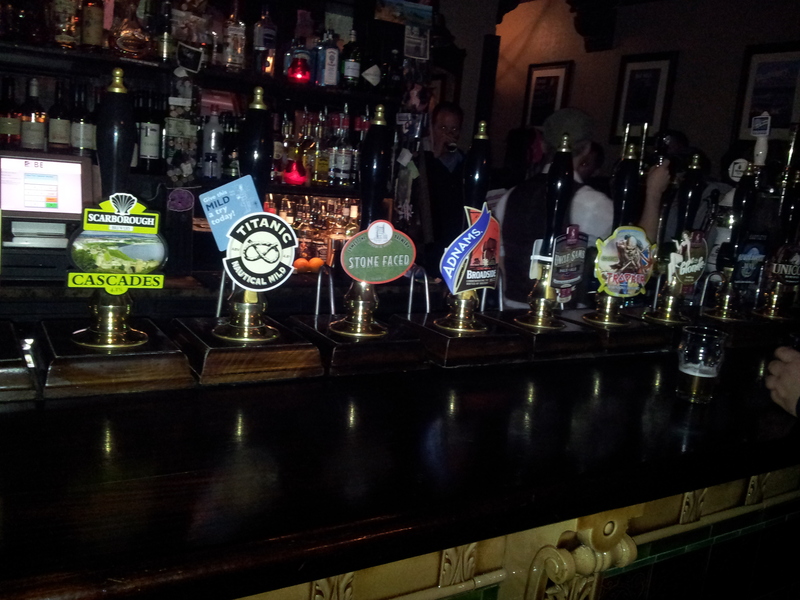 9 handpumps on the bar too! 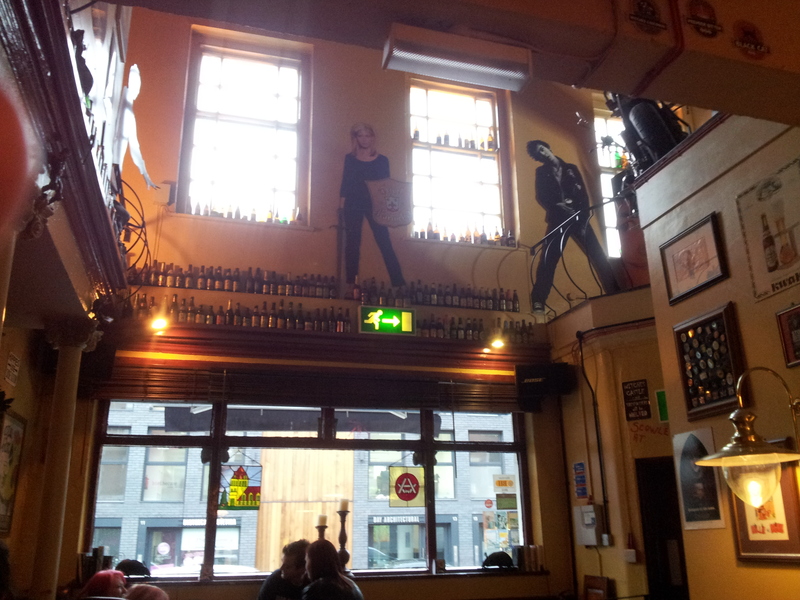 Assured of a good pint & good tunage in here. Beer? Another mild for me with Stokers Slake from Three Bs Brewery of Blackburn. A smooth Dark Mild with lots of roasted malt flavours and a slight smoky touch. Mmmm….. Walking in to the strains of Janis Joplin “Another Piece of My Heart” was a bonus. Misleading though as most of the following tracks had a distinct 80s bias. Modern Love by Bowie (a favourite – great circular chorus), Dancing With Myself by Generation X…..A little Joni Mitchell with Big Yellow Taxi gave a little 60s seasoning. 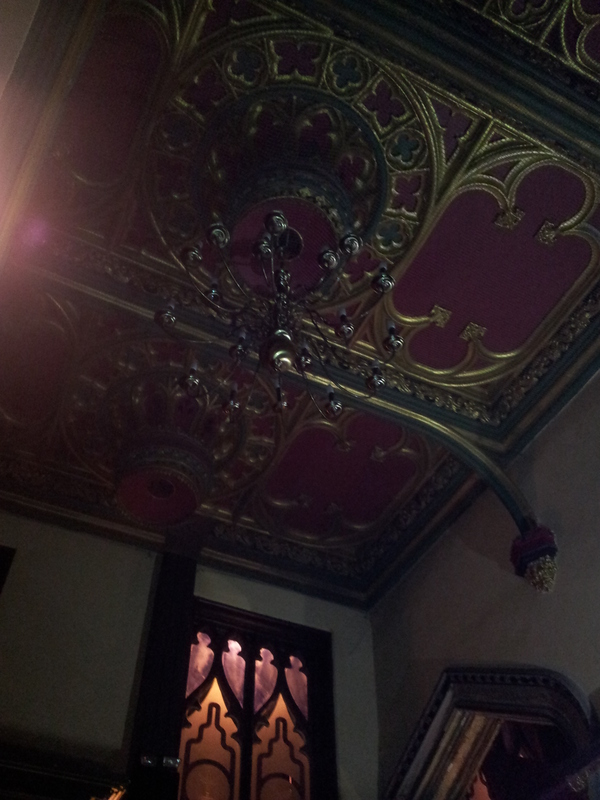 Good beer, beautiful pub. An architectural gem. (A gorgeous back room too). I like this place. A lot. Jaz now wanted to put his feet up and relax in his front room. 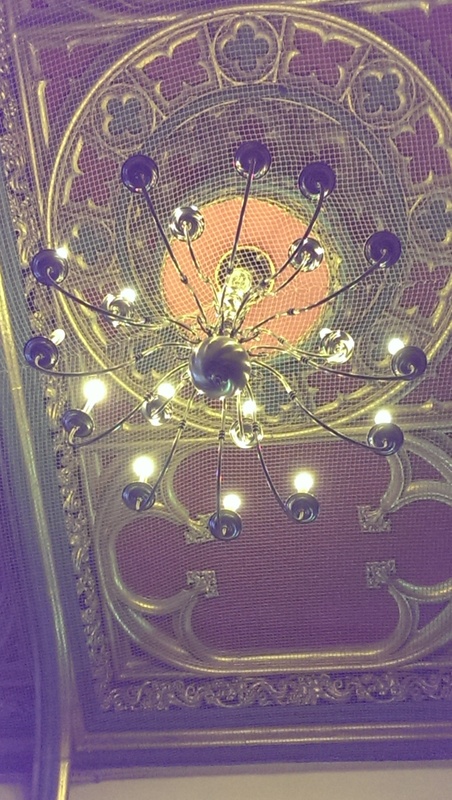 His front room being…. By now, you should all know what you get here! 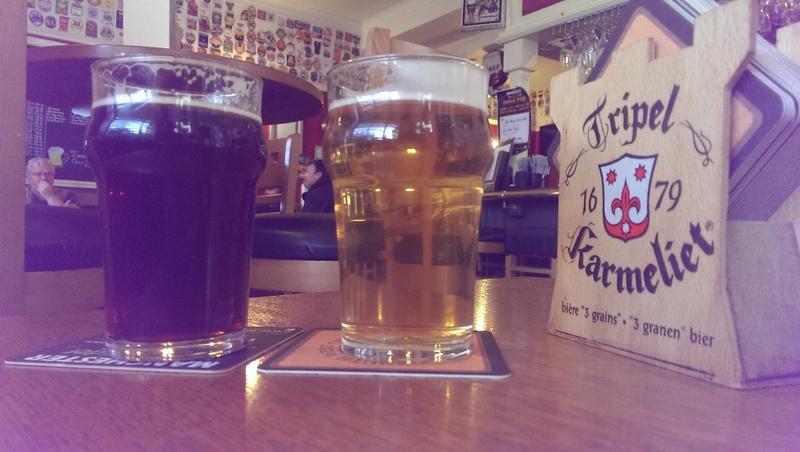 Craft beers in both cask and keg, reliably tasty and served by staff who drink them themselves and know what they are talking about. Simple eh? They do this stuff well. Which is why they’re always busy. 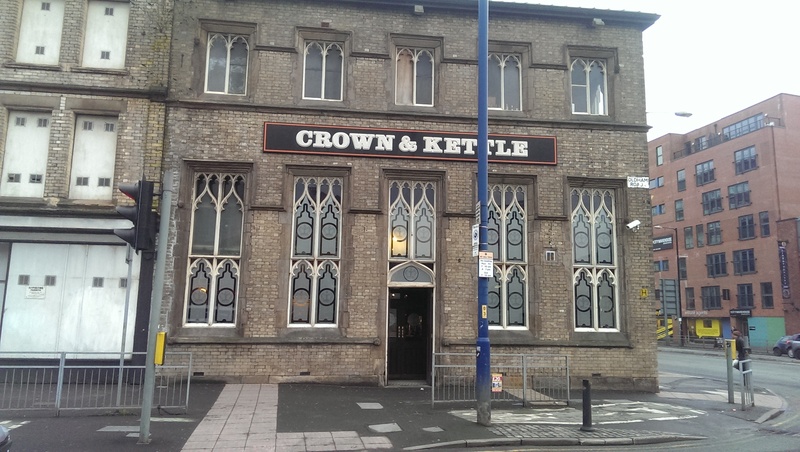 It isn’t an architectural gem like The C&K, but it does it’s job. Tonight, in the absence of a mild, I went local for American Amber Ale by Quantum Brewing from Stockport. Jay Krause does some great things with hops. But if that’s an amber beer, I need to go to Specsavers! What it is, is a nose full of beautiful hoppy aromas. Dark ruby coloured (as you can see! ), a mouth full of lovely malt with some licorice hop overtones. Only thing to add was it was probably my pint of the night! A nightcap Mr Jazwinski? Oh, I shouldn’t really! But if you insist, a 1/2 pint of Ageless by Redwillow please! I’ve only had this in bottle previously and it knocked me off my feet. 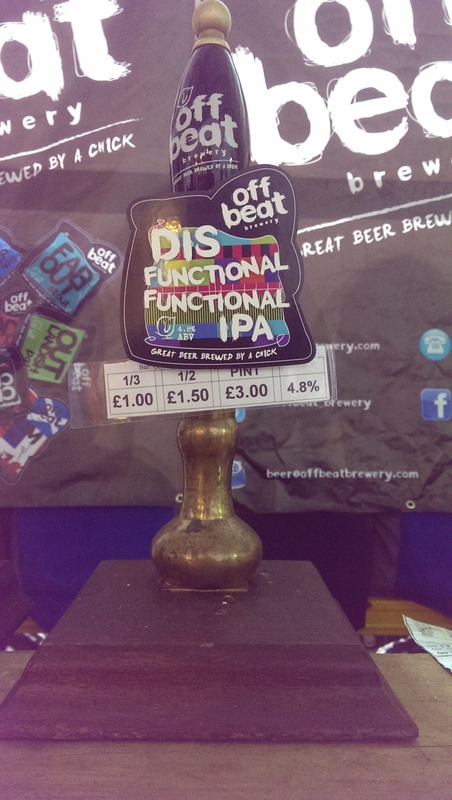 A double IPA full of grapefruit citrus joy. Pineapple as well. Joy! The same in the mouth with resinous notes. So good, I had to have another 1/2! Now Jaz is lucky. He only has to stumble 100 yards to his door, whereas I need the assistance of First Transport! So, off to Piccadilly with me for that old favourite. The last bus! On that note…..’til next time…..